In 1990, with a successful career modeling, acting and dancing on and off Broadway, Mike moved to Los Angeles to pursue Television and Film. It was during his LA transition that friends noted his talent when he created a new California look from his New York styled furnishings for his home in West Los Angeles. He made everything himself, taught to knit, sew and paint at the age of five by his beloved grandmother. Mike started his manufacturing company RAGS, with a line of fashion forward pillows that were sold through the trendy chic store Fred Segal. The pillow assortment grew to a full line of custom furniture and bedding that was distributed nationwide through designers and fine retailers such as Gumps and Neiman Marcus. Very quickly Rags grew to managing seven permanent showrooms around the country with over 50 employees. “Running the showrooms took much of the creativity out of what I loved most and that was designing". His next move was to close all the showrooms, take the top accounts and optimize them. The business has continued to grow from there. Happily designing every day, Mike partners with designers and retailers around the country to create their custom projects. 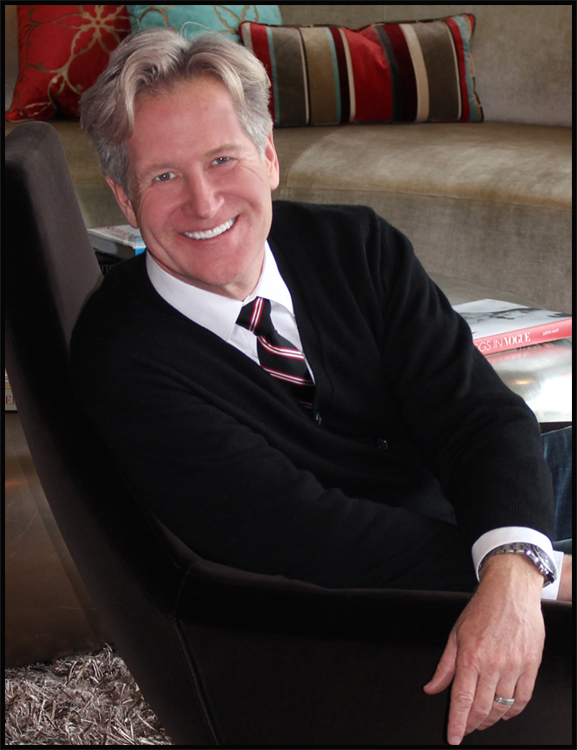 His company produces hundreds of pieces for high end residential interiors in collaboration with well known designers including Lisa Kanning, Kristin Dittmar, Barbara Glass and Kelli Ellis. Hospitality projects include The Breakers in Palm Beach, several Four Seasons and The Viceroy in Snowmass. He has also worked with numerous celebrity clients and his projects have been featured in In Style, LUXE, Interiors, Architectural Digest, Elle Décor, People, and Vogue, among other publications. Michael is a contributing Lifestyle Editor for Prowdr.com, a digital platform exclusively dedicated to providing extraordinary content written by sophisticated LGBTQ tastemakers and allies for our community and beyond. He has also been featured in “Homes Across America”, “Awesome Interiors”, “Kitty Bartholomew Show”, several episodes of “Extreme Home Makeover” and HGTV Series "The Real Designing Women"
Michael is a brand identity expert and consultant, having developed textiles, rugs, pillows, lighting, dinnerware and other accessories for Parker & Morgan, Disney, Tommy Bahama, Two Old Hippies and Jean De Merry. A recent addition to Mike’s portfolio is a line of hair on hide rugs produced at his workroom in Commerce, CA.